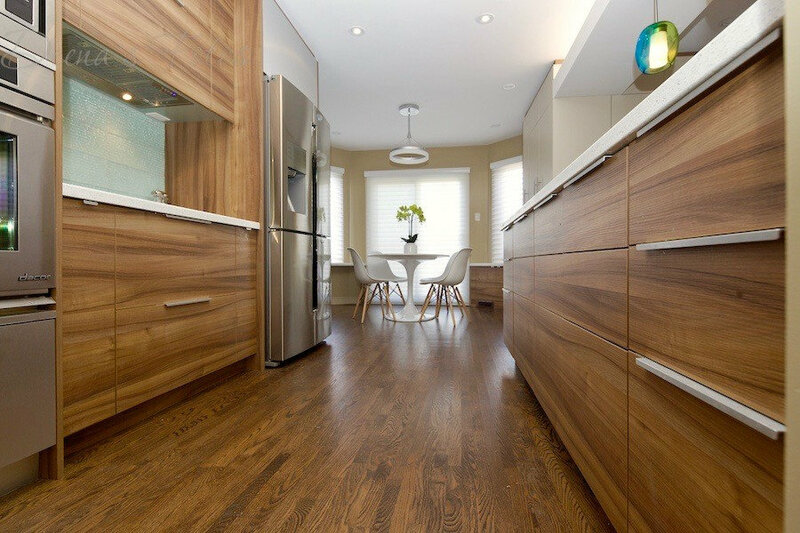 This redesign turned a cramped, dysfunctional outdated kitchen into the hub of the home where family can now congregate and interact in a whole new way. The result is open, bright and designed for the way the clients cook and live. By flipping the dining with the living room, people can sit and talk while dinner is being prepped. Full length pantries provide ample storage where they need it. Now, the solution opened up pathways for an efficient work triangle and circulation space. 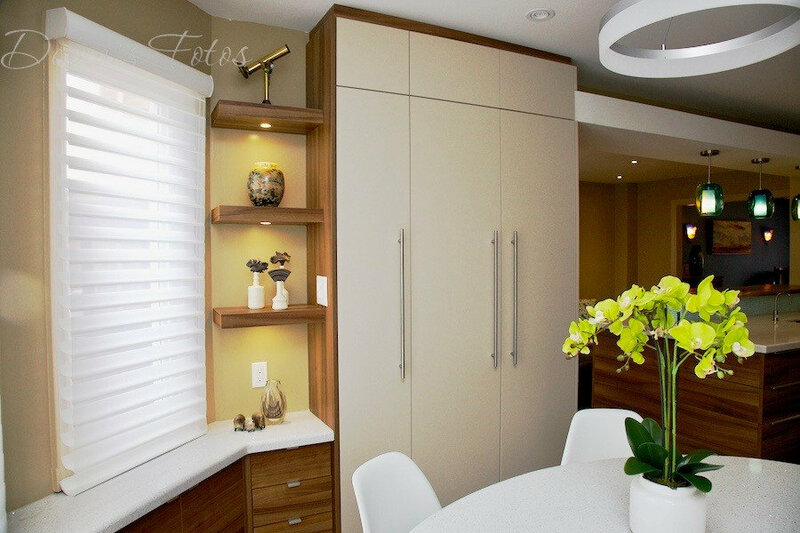 The dining space becomes its own entity and the kitchen provides ample storage. The solution contrasts with the original dysfunctional kitchen. When the dishwasher or cabinet drawers were open, the circulation and traffic become suffocating and stopped movement into and out of the kitchen. 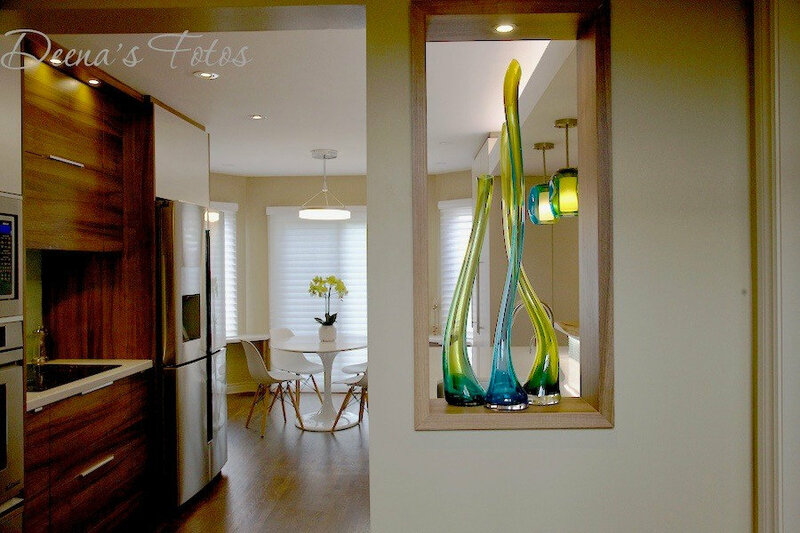 The clients love the way this renovation has completely changed the way their family interacts. The kitchen is now a functional hub where everyone congregates, cooks together and shares their day. The client loves the connection with natural materials. 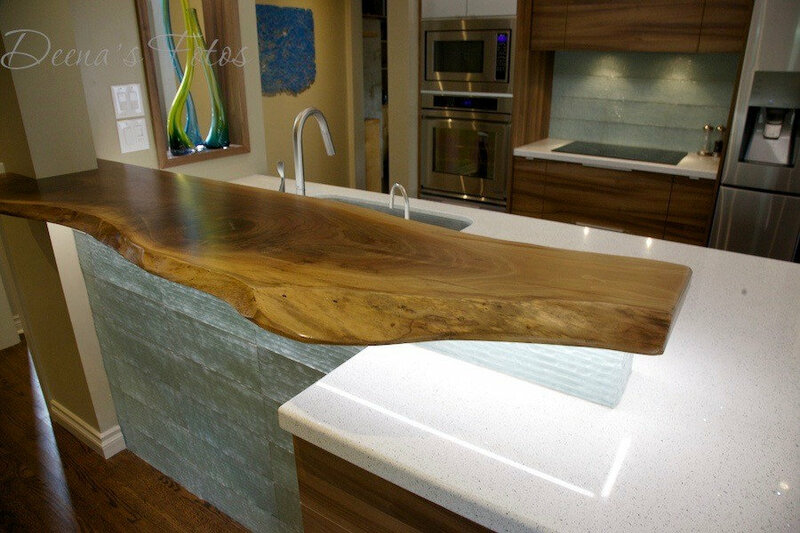 This live edge wood slab was selected to be the bar top, providing an organic element. The glass tiles look like falling water. Extra deep counters allow for more prep space and extra deep drawers for storage. 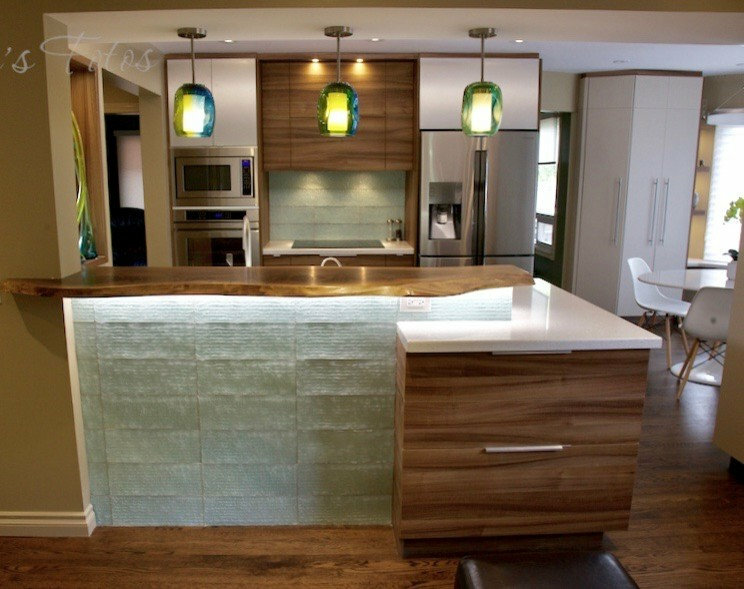 The bar top is underlit illuminating the workspace without any glare in the eyes. Washing the ceiling with LED cove lighting makes the space seem larger. 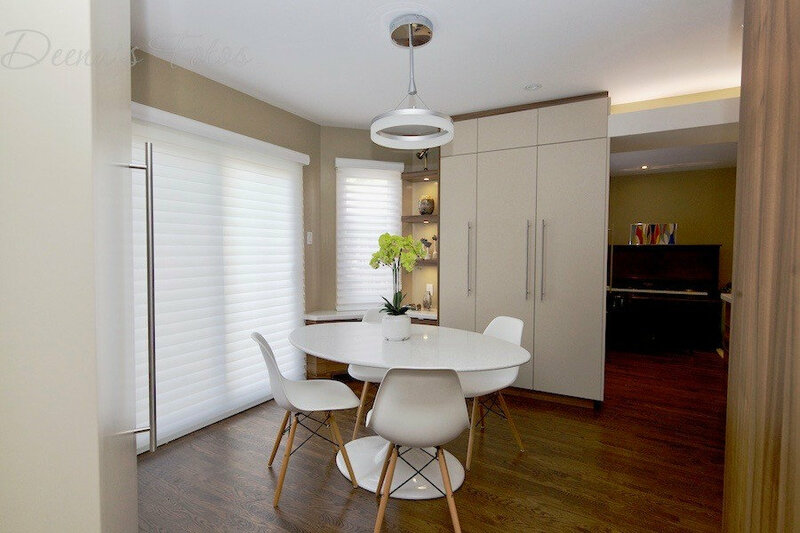 New silhouette blinds allow soft light to flood in. Warm woods and beige tones compliment the existing yellow palette. 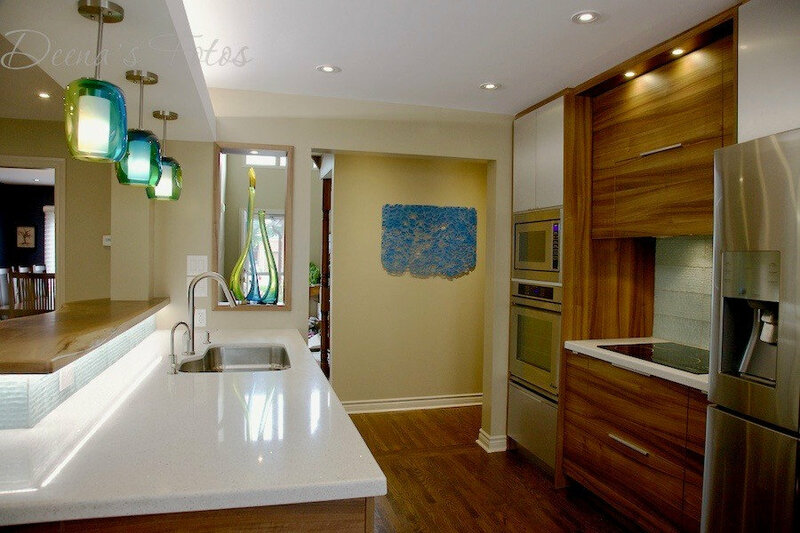 Cove lighting brightens up the space, creating a light atmosphere while enlarging the room.